At Holy Trinity, we emphasize participation, whether one is member, friend, or guest. 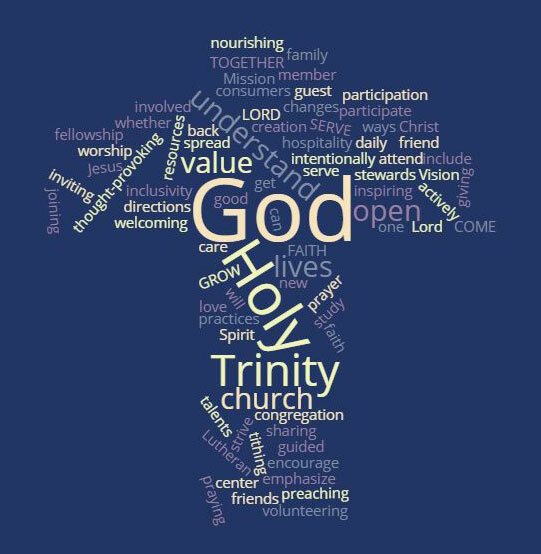 We are not a church of consumers and we encourage all who attend to actively participate in what God is doing at Holy Trinity. The ways you can get involved include volunteering, inviting friends and family, joining in fellowship, praying for the church and what God is up to, and giving back to God through tithing. We center ourselves in Jesus Christ. We value Lutheran worship and preaching that is nourishing, thought-provoking, and inspiring. We are a welcoming congregation that practices hospitality and inclusivity. We study to understand God’s will for our lives, intentionally open to understand each other. We are open to new directions and changes as guided by the Holy Spirit. We strive to serve the Lord in our daily lives. We spread the love of God by sharing our faith, talents, and resources. We care for God’s creation and each other by being good stewards.